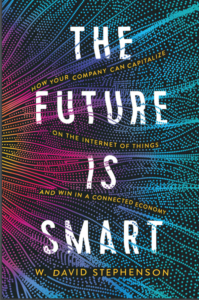 As I’ve remarked before, writing the Managing the Internet of Things Revolution e-guide to IoT strategy for SAP was an eye-opener for me, shifting my attention from the eye-popping opportunities for radical reinvention through the IoT (products as services, user-customizable products, seamless smart phone-car integration, etc.) to very practical ways the IoT could begin optimizing companies’ current operations TODAY (BTW: much-deserved shout-out to SAP’s Mahira Kalim: it was dialogue with her that led to this insight!). In that vein, I was blown away at this week’s IoT Global Summit by the roll-out of Egburt by Camgian. reducing potentially huge cloud-computing costs (because of the sheer volume of 24/7 sensor data) by allowing “fog computing,” where the processing would be done right at the collection process, with only the small amount of really relevant data being passed on to a central location. The highlight of the product launch was a live demo of Egburt in real-time use at a chain of dollar stores in the south, monitoring a wide range of factors, from floor traffic to freezer operation (Camgian pointed out the system paid for itself in the first month of operation when it recorded failure of a freezer when the store was unoccupied, in time for immediate repairs to avoid loss of frozen foods). Think about it: the very volume of Big Data possible with constant monitoring by a whole range of sensors can also be the IoT’s undoing. Since all that’s of interest in many cases is data that deviates from the norm, doesn’t it make sense to process that data at the collection point, then only pass on the deviations? retail to reduce heating and lighting, and maximize sales through tracking foot traffic patterns to optimize product placement. infrastructure: with sensors at key points such as bridges that will detect flooding and stress. smart cities: optimizing emergency response. “Communication Latency: Handling more processing at the network’s edge reduces latency from the device’s actions. Use cases that are highly time-sensitive and require immediate analysis of, or response to, the collected sensor data are, in general, unfeasible under cloud- centric IoT architectures, especially if the data are sent over long distances. “Data Security: By and large, sensitive and business-critical operational data are safer when encrypted adequately on the endpoint level. Unintelligent devices transmitting frequent and badly secured payloads to the cloud are generally more vulnerable to hacking and interception by unauthorized parties. Additionally, many enterprises may need to secure and control their machine data on the edge level for compliance reasons. IMHO, for the IoT to be widely deployed, especially in SMEs, devices such as Egburt that reduce the cost of collecting and processing data are a critical component.